UCSC's just-dedicated Engineering 2 has received a merit award for design from the American Institute of Architects, Los Angeles Chapter. The merit award honors built work designed by Los Angeles architects. Anshen + Allen Los Angeles was the architect for Engineering 2, which was dedicated on November 5. The award jury praised the use of different materials to heighten the scale change of the different functions in Engineering 2. Jurors included architects Toshiko Mori, dean at the Graduate School of Design at Harvard; Jim Jennings of San Francisco; and Dan Hanganu of Montreal. "Engineering 2 is already recognized as a striking addition to the Santa Cruz campus, but its handsome appearance is only part of the story," said Frank Zwart, campus architect and associate vice chancellor for physical planning and construction. 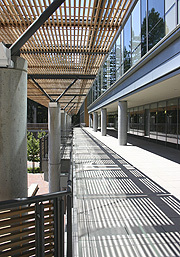 "It moved from initial design to occupancy in just over three years, a feat probably unmatched in the history of construction at UCSC. Its greatly accelerated schedule challenged everyone involved in the project: the architects and their engineering consultants, the contractors and subcontractors, the university's project development staff, and the School of Engineering's faculty and users." Zwart added, "Anshen + Allen's ability to meet a series of unforgiving deadlines and to produce an award-winning project simultaneously is an especially noteworthy accomplishment." Winning projects in the Institute of Architects competition represent 'the cutting edge in contemporary architecture, interior design and historic restoration, selected by a distinguished jury of local and internationally known architects,' according to the institute. Awards were given in three categories: design, interior, and "nextLA," for work not yet built.